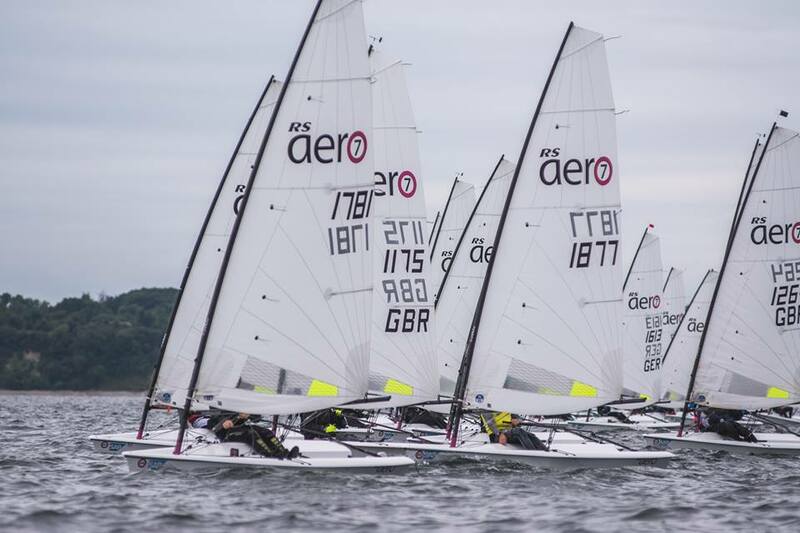 Following the Class’ World Sailing (ISAF) International Status last November the RS Aero International Class wasted no time in scheduling their first European Championship. The world renowned Travemunder Woche were selected as hosts, joining 4 other RS Classes and 230 RS sailors in total for a huge bonanza of competitive racing and camaraderie. 57 pre entries from no less than 11 nations signed up with just a few dropping out at the last minute due to illness or travel difficulties. Once there, everyone relaxed into the 30 degree sunshine and the amazing festival that is Travemunder Woche. The most noteworthy arrival was that of the Estonian’s after 27 hours along the length of the Baltic Sea with 14 RS Aeros on a 6 boat trailer and 2 large vans with 4 boats inside each! Over the weekend Kate Sargent of Holland/UK kicked off pre-event coaching primarily for the host nation followed by Peter Barton’s onshore brief for all, the afternoon before racing. The International party on Monday evening saw 16 nations sharing a common love for the sport. National costumes, drinks and food were swapped and a representative from all 16 nationals gave a short speech. The Swedes and the French sung. Junior representing RS Sailing did jokes, explaining that as the event 'get you back on the water' guy - "If you Brexit, I will fexit!". Everyone spoke of how happy they were to be part of the family, representing their country in Travemunde and part of the mass event. Whilst two days were lost due to light winds, the racing on the remaining three days enjoyed a variety of directions and medium breezes. 9 good races were held producing some worthy winners. The RS Aero 5s saw a close contest with Archie Hainsworth (GBR) narrowly winning from Andria Sillaste (EST). 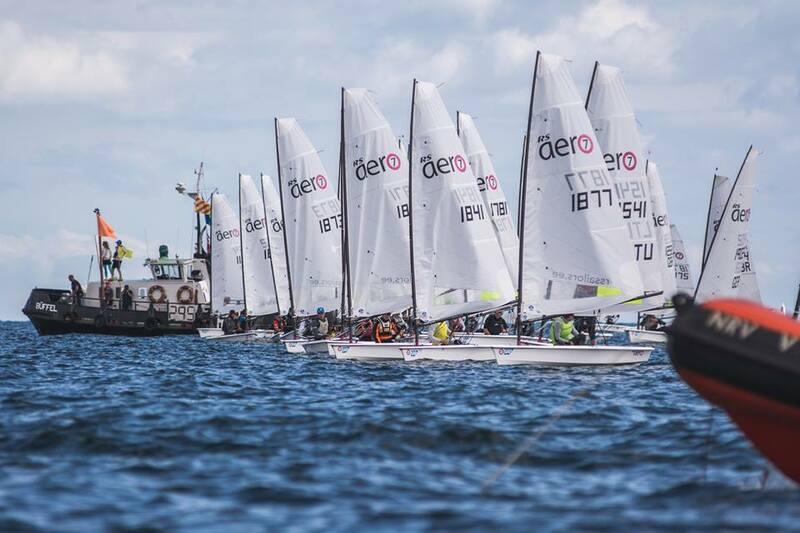 The eastern Baltic countries dominated the large 38 boat RS Aero 7 fleet with Dmitry Tretyakov (RUS) winning from Kristo Ounap (EST) after taking the last two race wins. 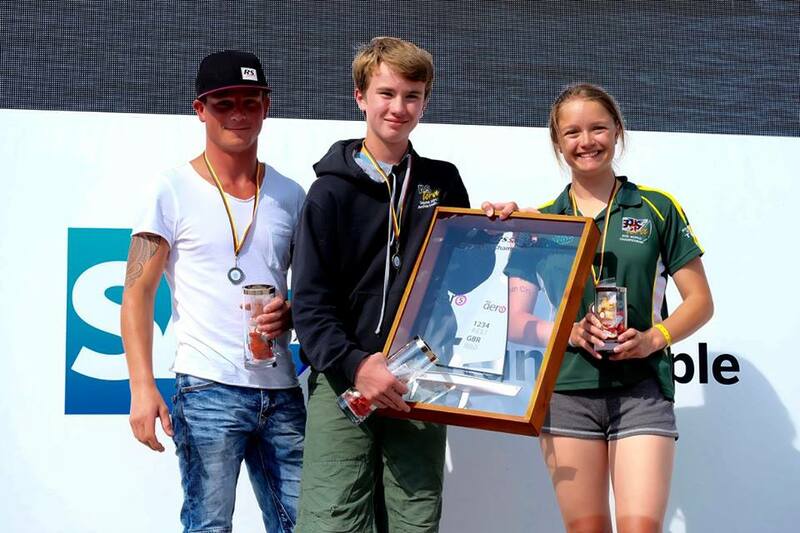 16 year old Simonas Jersovas (LTU) took the bronze following double bullets on day 2. In the RS Aero 9s the Brits got the better of the Swedes on this occasion with Richard Watsham’s experience overcoming Ben Rolfe’s youth. Matt Thursfield took the Bronze. 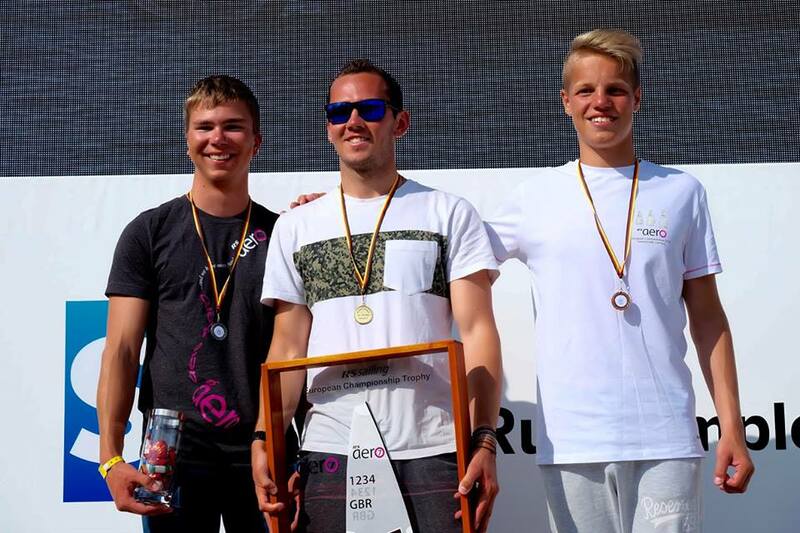 The Youth title (for under 19s) in the RS Aero 7s was hotly contested with Simonas of Lithuania victorious in 3rd overall from Greg Kelly in 8th and Ffinlo Wright in 11th, both from the Isle of Man (GBR). Archie took the RS Aero 5 Youth title. It was also encouraging to see so many more young sailors in the championship under the age of 22. 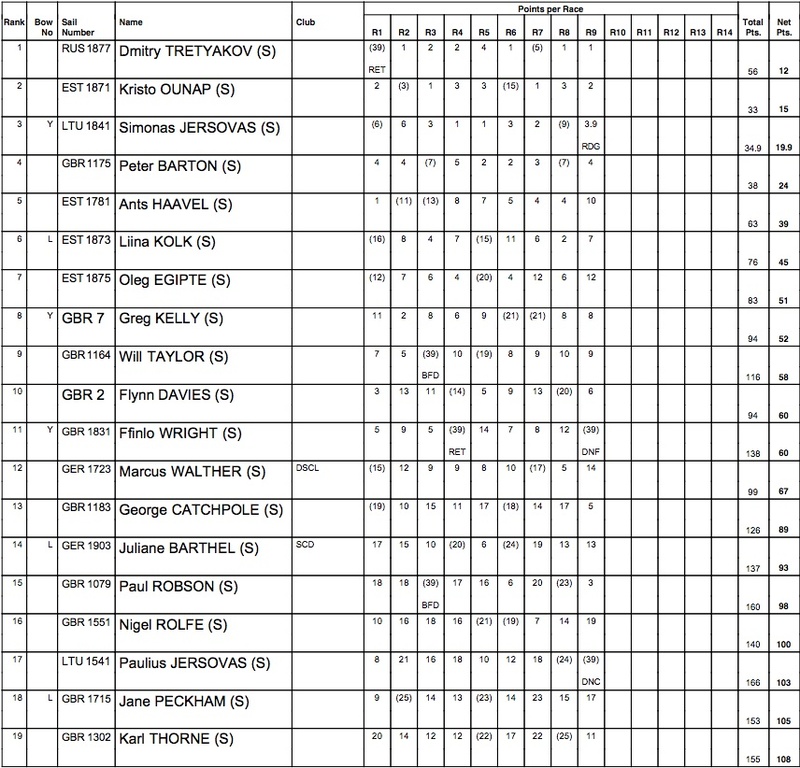 Six Ladies contested the RS Aero 7 fleet Ladies title and were spread throughout the fleet. Liina Kolk of Estonia put a great series together to take the title in 6th place overall from Juliane Barthel (GER) in 14th and Jane Peckham (GBR) in 18th. 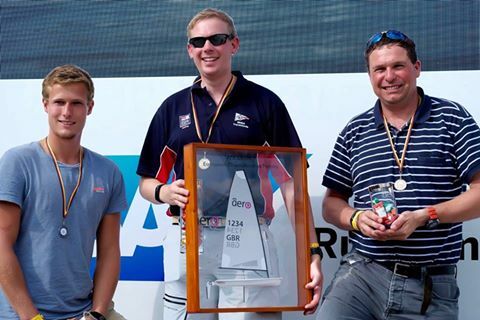 Top Master in the RS Aero 7 fleet went to Peter Townend (GBR) and in the RS Aero 9s was Christer Bath (SWE). Five teams duked it out for the European Champs Family contest with the inspirational father/daughter team of Ants and Silvia Haavel of Estonia taking to top spot. 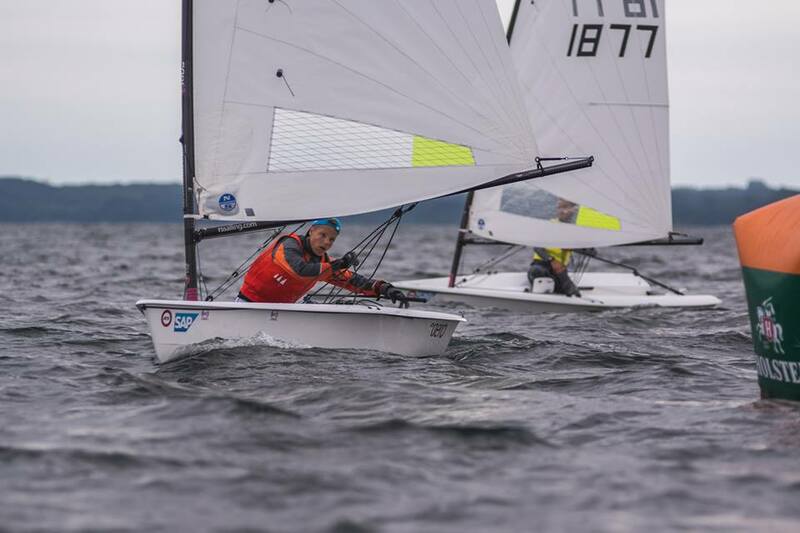 The first home nation RS Aero was Marcus Walther (GER) in 12th who has returned to racing after a few years off, having previously sailed Finns and Europes. Marcus now sails from the growing Frankfurt fleet at DSCL. 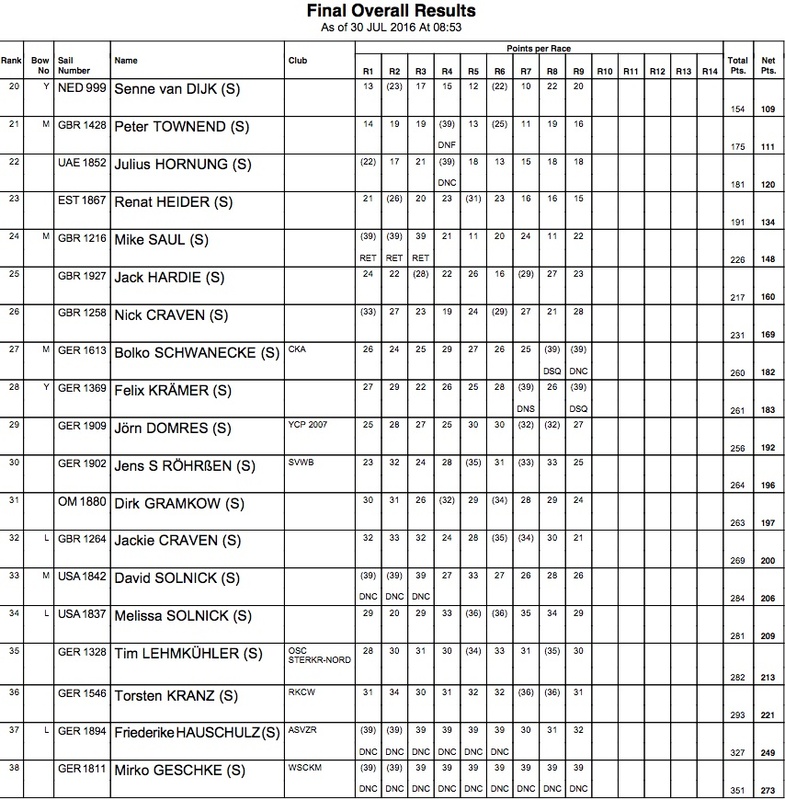 With 85 RS Aeros in Germany to date there is now a regular event circuit established this year. (GBR) in 3rd. 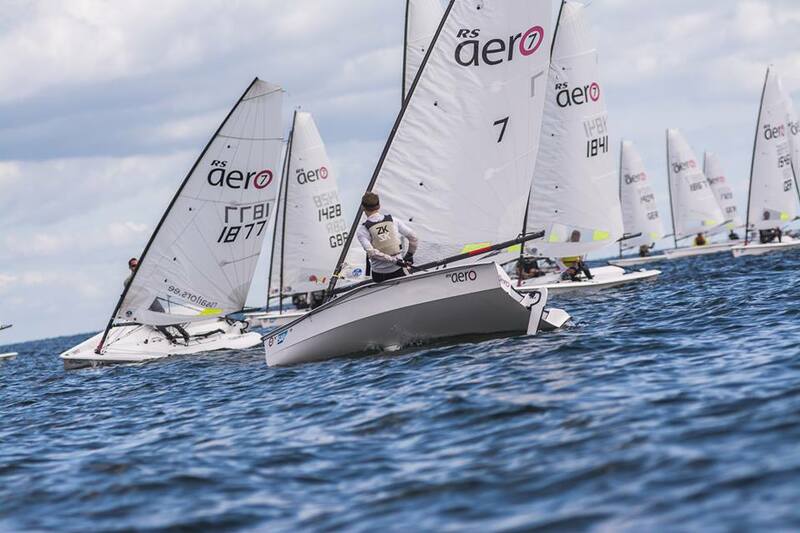 The rest of the RS Aero fleet, RS Classes and spectators enjoyed the spectacle of the RS Aeros racing under a backdrop of a 12 Metre under sail and the ‘Passat’ tall ship with a beer in the sun! On Thursday evening, the entire RS fleet of around 230 sailors was invited to a reception on the 'Passat' – the wine, beer and food were consumed with enthusiasm and followed by the customary trip to the huge tented entertainment area on the beach to bop away any remaining energy! Thanks to Heather Chiperfield for organising this fantastic venue for the RS Classes and to everyone for making our first European Championship one to remember! 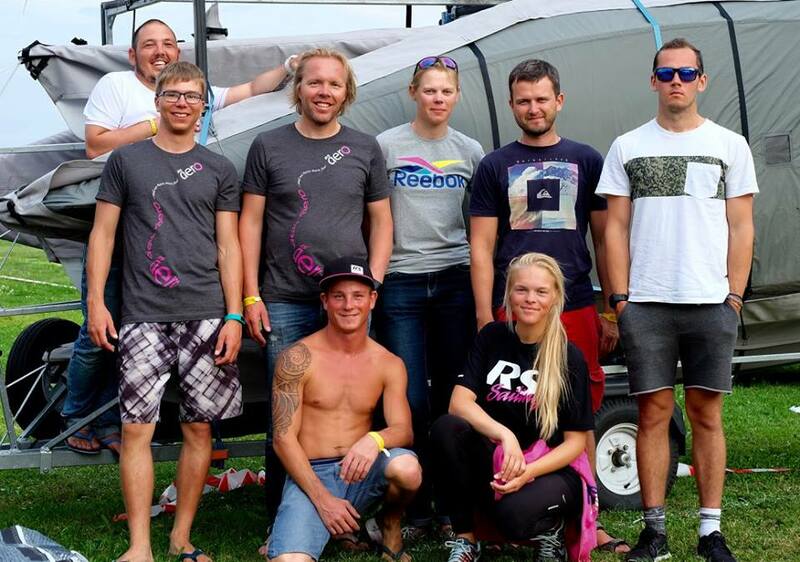 Next up on the RS Aero International Calendar are the RS Aero USA Champs next week at the Columbia Gorge, Oregon followed in September with the annual RS Aerocup at Malcesine, Garda from 22-25th. The first RS Aero World Championship will be held at Carnac, France, from 24-28th July 2017. PHOTOS A full captioned gallery can be found HERE.